There is good evidence for a number of environmental shifts during the last 2000 years, but the most noteworthy event may be the climatic fluctuation during the Little Ice Age (LIA) period. 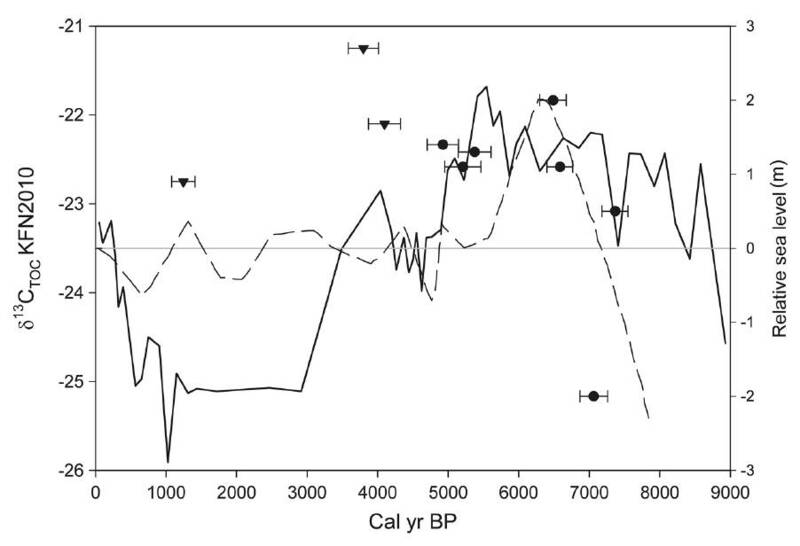 Evidence for a lower sea level on the southern coast during its earlier phase (1520 or 1570 AD) may be a reflection of widespread anomalous conditions during this phase (Marker 1997). Abb. 1: Meeresspiegelentwicklung an der Westküste Südafrikas während der letzten 9000 Jahre (BP=years before present). Es gilt die durchgezogene Linie (nicht die gestrichelte). Quelle: Carr et al. 2015. The complete picture of Maputo Bay patterns with its modern sedimentary environments including Inhaca Island may have evolved when the sea level has stood close to its present level around 7000 – 5000 years BP, after which the Maputo Bay became more or less stable. Eine Meeresspiegelabsenkung zwischen 800-1300 n. Chr. aus Mosambik dokumentierten Sitoe et al. 2017 (deren Abb. 5). Seit 1300 n.Chr. steigt der Meeresspiegel wieder langsam an, hat aber das Niveau von 800 n.Chr. noch lange nicht erreicht.